Fishermen on the Fraser River were back at work for a few hours this week, but didn't find anything like the record bounty of sockeye that came streaming a year ago. 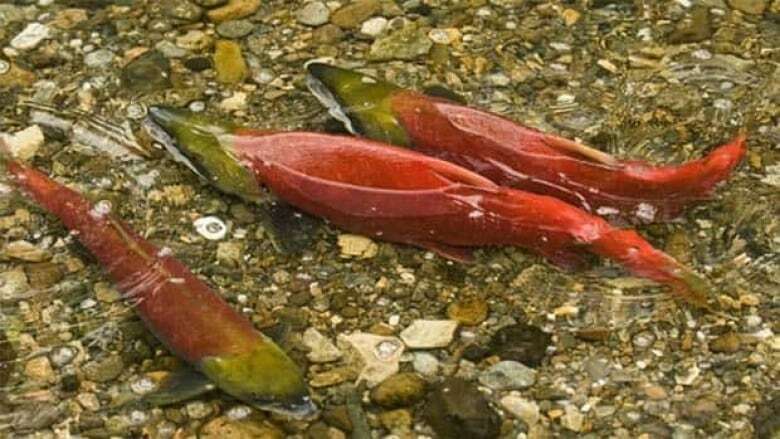 Barry Rosenberger, area director for the Department of Fisheries and Oceans, said while 30 million sockeye swam up the river last year "in the largest run since 1913," only about 4 million sockeye are so far predicted to make the run this year. He said 80 to 90 per cent of the salmon on the Fraser River are on a four-year cycle, and last year's massive run was a result of a strong Adams River run. The Adams River is located east of Kamloops, B.C. in the Shuswap. Rosenberger said the average for this four-year cycle, however, is 4.6-million sockeye, the majority of which come from the Chilko River, which is located west of Williams Lake, B.C., in the province's Cariboo region. "This year is returning about average," said Rosenberger. "It's doing much better than four years ago in its cycle ... 1.5 million was the return four years ago, so this is a significant improvement on the cycle line." When it comes to comparing this year's run with last year's run, Bob McKamey, vice-president of the Area E Gillnetters Association, agrees with Rosenberger. "There's no real comparison between last year and this year," he said. The Fraser River fishery is comprised of four runs: the early Stewart run, the early summer run, the summer run and the late summer run. McKamey said that on Thursday about 275 boats dropped their nets, hoping to catch some of the 480,000 sockeye expected to swim up the Fraser during the early summer run. The average boat caught about 150 to 200 fish, adding the average sockeye weighed about 2.7 kilograms and the average fisherman was receiving about $2 per 0.45 kilograms. McKamey said some of the fishermen were able to sell whole sockeye to the public for $15 to $20 each. The higher revenues should help gillnetters cover their startup and gear costs, which comes as good news, he said. "You could just see the smiles on their faces to finally get back on the river," said McKamey. "We had really nice weather and nice conditions. The fish were in absolutely perfect shape. They were beautiful." He said every opening is a good opening, but Thursday's opening wasn't terribly lucrative and much of the fleet was still fishing in other areas. McKamey said gillnetters were hoping for another 12-hour opening next week. But on Friday, the Pacific Salmon Commission announced gillnetters would get another six-hour opening on Tuesday on the Fraser River. It also predicted two million sockeye would participate in the summer run, the majority of which are Chilko sockeye, according to DNA test results. The commission announced it would likely adjust the summer-run numbers next week as more data is collected. McKamey said gillnetters should do well during the six-hour opening provided there are a lot of fish. Rosenberger said gillnetters in the Johnstone Strait, which is located on the northeast coast of Vancouver Island between Port Hardy and Campbell River, received an extension to their opening this week. He said the gillnetters were supposed to fish from 6 p.m. Thursday until noon Friday but will now be able to fish until noon Saturday. Trollers will also have an opportunity to drop their lines in the Gulf of Georgia and the Johnstone Strait during a one-day opening Tuesday, he added. On Wednesday, the Cohen Commission is expected to resume hearings. The commission is examining the collapse of the Fraser River salmon fishery in 2009, when 10 million fish were expected but only one million actually returned.